It goes without saying that the quality of goods and services is the key to customer satisfaction and sustainable success. The CAQ.Net® software solutions provide you with all the tools you need to achieve said quality and thereby consistently strengthen your brand through customer satisfaction. Quality is when the customer comes back, not the product. This statement underlines the sheer economic necessity of a well functioning quality management for a company. The consumer goods industry serves as a prime example for this aspect, as the consumers need to be convinced of purchasing the durable or nondurable goods over and over again. Apart from the price, it is primarily the quality of the product that motivates consumers to repurchase it. In order to be able to produce said quality, companies must consistently and comprehensively focus on all quality-related aspects of the production process. The various CAQ.Net® solutions provide the perfect toolset with which to put this focus on quality into practice and improve, document, and uphold the quality of products. Customers look for products that provide good value for money and that are high-grade and safe. These wishes can only be achieved by providing a consistently high level of quality. Quality together with tradition and consistency are what top brands are made of. Sophisticated production processes and quality techniques create the know-how in companies that allows them to better market their products and achieve advantages over their competitors. We offer our many customers in the consumer goods sector modular and scalable quality management solutions that allow them to ensure the quality and safety of their products even throughout large production volumes, rapid product lifecycles, and international cross-border production lines. Whether process management, supplier management, document management, or training management: CAQ.Net® allows you to boost the quality of your products and excel at customer satisfaction. The service industry (or tertiary sector of the economy) deals with the provision of services to other businesses as well as final consumers. It is most probably the fastest growing industry sector in the world and, in Germany for example, approximately 75% of the workforce already operate in this sector. The importance of quality has grown en parallel to this and now the quality of a service and not merely its price has in many cases developed to become the decisive factor that influences customer choice. Several standards have developed in the recent past in order to be able to monitor and document quality in the service industry – over 700 ISO standards, for example, deal with the service industry. The DIN SPEC 77224, for instance, deals with achieving service excellence instead of mere customer satisfaction. As is the case in virtually all other industries, the management requirements of ISO 9001 and proactive complaint management in accordance with ISO 10002 serve as the prerequisites for this standard. The quality of a service is just as measurable as the quality of goods and, hence, can just as easily be controlled and improved: CAQ.Net® provides a toolset for achieving just that. Whether document control, KPIs and dashboards, training and qualification management, or process, change, and workflow management: use CAQ.Net® to analyse, monitor, and document the quality parameters in your company and apply reliable information for the continuous improvement of the status quo all the way to service excellence. 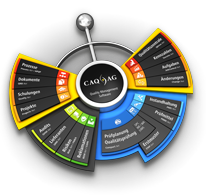 CAQ AG has over thirty years of experience in the field of computer aided quality assurance and quality management. Our first customers included a variety of companies from within the consumer goods and service sector. Over the decades we have continued to support said customers in the implementation and maintenance of our standard-compliant software solution and many of these customer relationships have since developed into knowledge sharing partnerships. These partnerships allow us to continuously improve our product and rapidly adapt to changing industry demands. The resulting target/actual comparison between CAQ.Net® and the most current requirements in this sector, means that our customers are always in command of a cutting-edge software solution that allows professional, efficient, and standard-compliant quality management. Successful quality assurance and management requires an all-inclusive management solution that covers all quality-related facets and safeguards consistent compliance and traceability. This solution must incorporate all aspects of quality management and facilitate the adherence to valid standards and guidelines. This solution is CAQ.Net®: your all-inclusive management solution for the consumer goods and service sector. Cross-modular linkage of articles, article groups, processes, documents, inspection plans, etc.